Most people find meditation to be helpful and a worthwhile undertaking. I do recommend that people try it, especially people who have IBD. But for me, however, it hasn’t been quite the experience I expected. I recommend that people with chronic illness meditate. I even did a podcast with Dr Tiffany Taft, a behavioral psychologist, that focused heavily on getting started with meditation as a tool for stress relief. But me? Yeah, I don’t meditate. Or, I didn’t. I have my time when I’m running or walking, either outside or on my treadmill, that I consider my meditation time. It’s a moving meditation. That’s what I tell people. I get quite cranky if I get interrupted or if I don’t get that time. But it’s not really traditional meditation, and I know that. The time came when my friend and colleague, Dr Barbara Bolen, had an offer for a free trial of a meditation app. So I asked her if I could have it, she graciously gave it to me, and I downloaded the app. 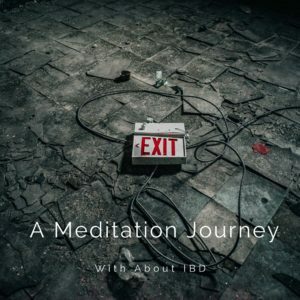 This is my journey through the first week, having never done any formal meditation in the past. This entry was posted in Meditation and tagged existential dread, ibd, meditation, stress relief, thoughts on March 13, 2018 by Amber.